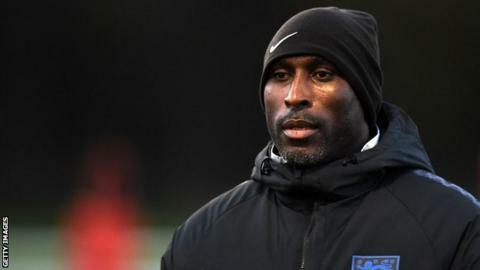 League Two side Macclesfield Town are in talks with ex-England defender Sol Campbell about their vacant managerial position, BBC Radio Manchester reports. The 44-year-old has never managed, but recently worked alongside England U21 boss Aidy Boothroyd. In 2014, he described the lack of Black, Asian and Minority Ethnic (BAME) managers in English football as a "sad indictment" of the game. He has previously been linked with Grimsby Town and Oxford United. Macclesfield are bottom of the English Football League having won just one of their opening 18 league games. Assistant managers Danny Whitaker and Neil Howarth have taken charge since the sacking of Mark Yates on 8 October. Former Tottenham Hotspur and Arsenal centre-half Campbell made 646 first-team appearances between 1992 and 2011. He once described himself as "one of the greatest minds in football" and claimed he would have been "England captain for more than 10 years" had he been white. His recent involvement with the U21 setup was part of a Football Association plan to create BAME coaching placements "across all England teams".